This sample price: priced within the past 7 days for arrival on Wednesday, June 26, 2019, departure from Chicago (All Airports), IL. Choose your own departure city and dates. Combine the frenetic energy of Barcelona(known for its art and architecture. 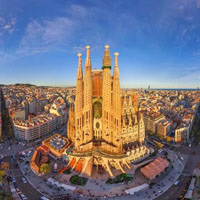 The fantastical Sagrada Familia church and other modernist landmarks designed by Antoni Gaudi dot the city) and the stunning Lloret de Mar in Costa Brava (with its temperate climate and impressive beaches) with a rental car. This is a flexible vacation package. Select your number of nights in each city, desired hotel and activities. Most of the charming coastal towns and some of the most spectacular coastal scenery is located north of Barcelona. The area has a brilliant light quality which has caught the eye of many an artist over the centuries. Some of Spain's finest beaches are located in the Costa Brava, and local wines and seafood are of the highest quality. As Dali portrayed in his many paintings of the region, Costa Brava has an "embarrassment of riches".